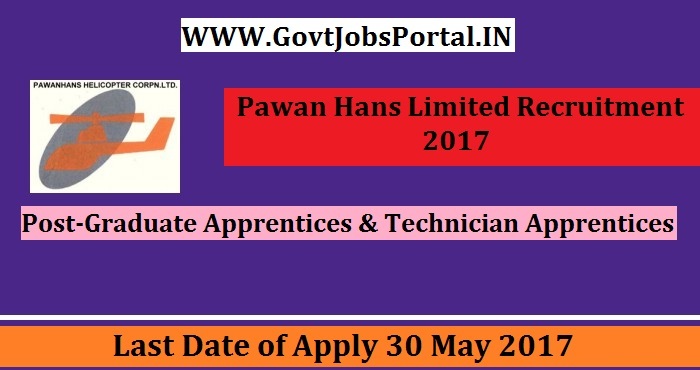 Pawan Hans Limited is going to recruit fresher candidates in India for Graduate Apprentices & Technician Apprentices Posts. So, those candidates who are willing to work with this organization they May apply for this post. Last Date of Apply 30-May-2017. Total numbers of vacancies are 44 Posts. Only those candidates are eligible who have passed Graduate in engineering or BSC (PCM)/BCom/BA & Diploma in engineering or 12th Pass(10+2) with Diploma in Office Management, Accounting & Taxation, Secretarial Practices. Indian citizen having age in between 17 to 25 years can apply for this Pawan Hans Limited Recruitment 2017. Educational Criteria: Only those candidates are eligible who have passed Graduate in engineering or BSC (PCM)/BCom/BA & Diploma in engineering or 12th Pass(10+2) with Diploma in Office Management, Accounting & Taxation, Secretarial Practices.